"NIST legitimately debunked conventional explosives due to the insufficient decibel levels recorded and observed." Thanks for making me spit my coffee all over my keyboard, I love laughter to start my day. "They can further be debunked by the duration and nature of under-rubble hot-spots not requiring oxygen and smoldering for many weeks"
Which you gave no evidence of, but, I am sure NIST, 9/11 commission report or maybe Dr Wood's will be happy to send you some "official" documentation showing this? Herr der Elf wrote: I can see where this thread is going. Tut,tut, Mr Elf - I beat you to that line a few posts ago, you copycat you! Herr der Elf wrote: I seemed to have struck a nerve. Evidentally, if I have to reference any imagery whatsoever to make a point, you are going to pull the ploy "all imagery is faked, so you can't use it to prove squat." 'Evidentally' (as you say), the nerve you struck is located in your own mouth - and you now finally spat out the true objective of your visit to this gracious forum: to ultimately characterize our entire 9/11 research (which, of course, focuses on the news media's crucial role in the scam) as some sort of sinister 'ploy'. Your initial, seemingly humble attitude (repeatedly describing yourself as the easily duped sort) clearly paved the way for this cheap 'cliffhanger finale'. 2: Say so to sound friendly - only to get a foot in the door and attempt a few (lame) backstabs at it. I was expecting that one from you - sooner or later: yeah, we're all senselessly wasting our time here - picking on innocent, cosmetic editing "for better framing in publications". Rrright ! Thanks for the hearty laugh. Herr der Elf wrote: Our beloved corporate media was complicit in the cover-up. Being found guilty of this lesser charge won't rock their worlds too much. They change corporate names and logos and continue to milk profits of the media-addicted masses. A friendly reminder for you: they also sack inept, dopey employees/gatekeepers before they start becoming a liability for their damage control operations. Herr der Elf wrote: No sense me continuing with this line of thought here. Well said - you beat me to that line, Herr Eleven. Goodbye now. thank you for pulling the plug Simon! Reading Elf's posts was starting to feel like reading a discussion from 6 or 7 years ago. Frankly exhausting. "People flying in the helicopters" "the observable evidence" "energy sink" "pulverized concrete" "nano-thermite"... the whole truther repertoire... personally I feel like having left those categories and ideas behind light years ago... who wants to go back? I sometimes wonder - after almost half-a-decade of analyzing the 9/11 imagery, just why it took such a long time or me (or anyone) to notice the atrocious crassness of it. There are mysteries aplenty in this world, but this particular mystery (why I didn't fully grasp the evident bogusness of the entire pool of 9/11 imagery) has had me scratching my head for a long while. I now realize that this was all part of the 9/11 plotters' plan. I happen to know a little about (1) ship collisions and (2) structural damage analysis and (1) in most cases the smaller ship bounces against the bigger one (and does not disappear into the bigger ship) and (2) a small, weak, top part C of any structure cannot crush down by gravity the bigger, stronger bottom part A of same structure that carries C ( http://heiwaco.tripod.com/tower.htm ). So any footage of collisions, where the small weak objects disappear into the big strong objects, or collapses, where the small, weak tops crush down the big strong bottoms, are fake. Basic! Which of the two above images are we supposed to believe in? Would it be logical to believe in one of the two? Look! that white smoke was left by Neo flying away from the city. Reference to the ending scene of The Matrix. I consider the point I am about to make extremely important - for the historical record of the 9/11 TV FAKERY research. As someone who has closely monitored, compiled and researched the 9/11 imagery for about half a decade, I wish to make it very clear that the bulk of higher-resolution imagery we have today was certainly NOT available to the public as I started my September Clues research - around 2006. The sharper imagery we have today has been trickling out year after year - as if their authors (photographers and videographers) had jealously kept them in their drawers for many years. This, of course, doesn't make any sense. 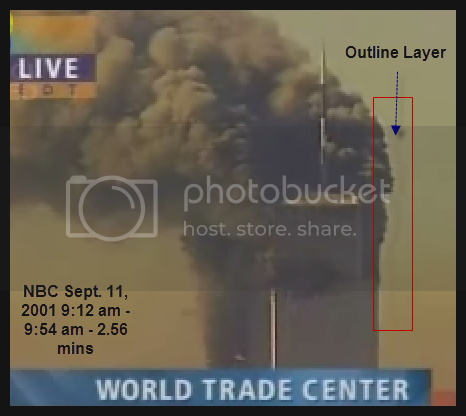 For instance, I clearly remember (back in 2006/2007) having great problems finding images/footage of the WTC1 collapse. (Today, of course, you will find tons of WTC1 collapse imagery, with a few search clicks - and faster than you can say "WTC1 collapse imagery"). Now, those who weren't investigating 9/11 at the time will only have to take my word for it; this is certainly unfortunate, but please think about it: how could I possibly have documented such a fact at the time? Even if I had been smart enough to anticipate that we would eventually be flooded with new, fresh, high-res 9/11 imagery, how could I have recorded any proof of the scarcity of such crucial 9/11 imagery back then? Internet searches disclosed no videos of WTC1's collapse, a somewhat disconcerting situation in that probably hundreds of video cameras were focused on that tower after the collapse of WTC2. 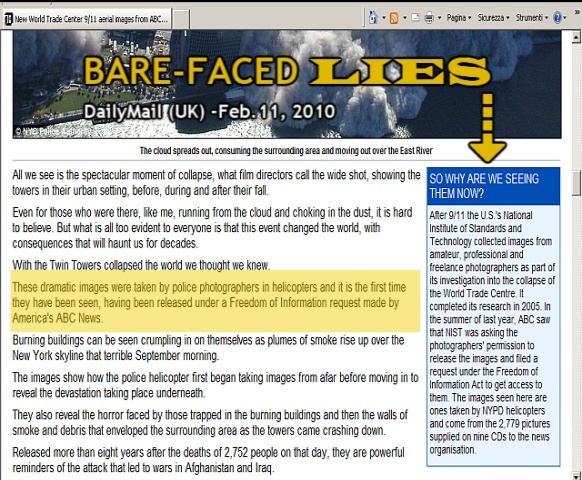 Some who have studied internet videos conclude that WTC7 fell in almost free-fall time. This is odd, considering the seismic results. Such a disparity raises the possibility of tampering with either the seismic or the video evidence. NIST: At the forefront of the 9/11 IMAGERY COVERUP! Now, I trust everyone is fully aware of the central role played by NIST (the National Institute of Standards and Technology) in covering up the 9/11 scam. Clearly, NIST's ridiculous/outlandish 'scientific conclusions' as to the physics of the collapses of the WTC towers (the two of which purportedly came down in "9 seconds" and "11 seconds" respectively!) are just a propagandistic diversion aimed at focusing people's outrage/attention on the collapse physics (AS SEEN ON TV). In this way, NIST feeds their phony opponents (such as A&E for 9/11 Truth) with fodder for constant, circular controversy - aiming to uphold an endless dog-and-pony show for another 50 years. Of course, there is no more WTC rubble to analyze: it was all quickly removed. Any "explosive evidence" anyone might come up with(Nano-Thermite/Nukes/DEW and whatnot) is bound to remain dust in the wind. What evidence remains? What demonstrable, verifiable and repeatable proof are we left with - to expose 9/11 for being the hoax that it was? As far as I can tell, all we have left is the demonstrable, verifiable and repeatable evidence of image fakery. Naturally, there follows that NIST is also in charge of covering up the 9/11 image fakery; in fact, this is probably today on the very top of their agenda. "Some footage I shot on 9-11-01. This is never before seen footage and has never been released. I chose to upload it because I feel it has historical importance. Like many New Yorkers I know some of the people who have passed and I know many people who have lost a loved one. Some of the footage is considered graphic as is some of the language. Unfortunately, this is a day I will never forget. May God Bless those who we lost on that terrible day." What a big, fat joke this all is. And it is so funny to see that in the same years all these sit-coms and movies have been "re-mastered" and turned into "HD", extra sharp, high quality pictures. But, what a joke! How can the 9/11 amateur videos follow the same laws of products filmed in studio? This is laughable! It is like an admission of artificiality! Here is the previous DVD version (slightly less cropped). In this one, it is even impossible to make out the little 11/9 hint on the fridge! We can only conclude that, obviously, the tv show was filmed in the best quality available, and then downgraded according to the different supports. 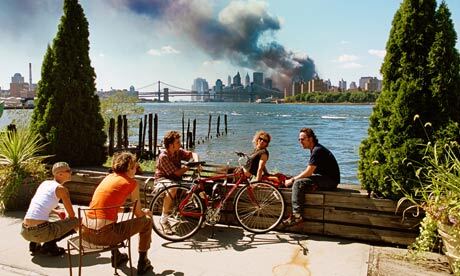 Now, how is it possible for the 9/11 imagery to follow a similar process of enhancement? Suppose you have a bad quality video taken with a camera 10 years ago: are we expected to believe one could turn it into a high definition product like the one we see above? Unlikely! Conversely, suppose the newsmedia had the best quality available of those videos from day one. That's the stuff that makes journalism relevant. Imagine the details they could have shown. Why showing the atrociously bad, short, repetitive clips instead? Luckily, though, even the "high-quality" new remastered material defecated by NIST eventually can be torn apart and exposed as inconsistent, manipulated... Which is not surprising, considering that it comes from the same sick minds. This constant release of "new" material is so ridiculous. Can any rational individual imagine somebody having compelling footage and not sharing and uploading it immediately? This would not be the case of course and it only points toward the artificial nature of the footage and thus the event. I spent 10 years mostly studying and reading truther material. I bought in to all of that and stayed in an emotional haze that never once considered the idea that nobody died. Now I take great pleasure in reviewing the event with a clear mind and no emotion and it is all so obvious. Years wasted on Webster Tarpley, Loose Change, Alex Jones, Jeff Rense etc. I've never seen Rense post anything addressing the views held here but he had Judy Woods on his radio program and I wasted a couple of hours trying to make sense of that crap. Simon et al, I am very grateful to you for opening my eyes. Thanks to you and this site I can now seem even more insane to family and friends than when I held the typical "9/11 was an inside job" view. I think this video really highlights how atrocious the renderings are, especially the "live footage" from that day. Last edited by Equinox on Thu Mar 15, 2012 12:26 pm, edited 1 time in total. 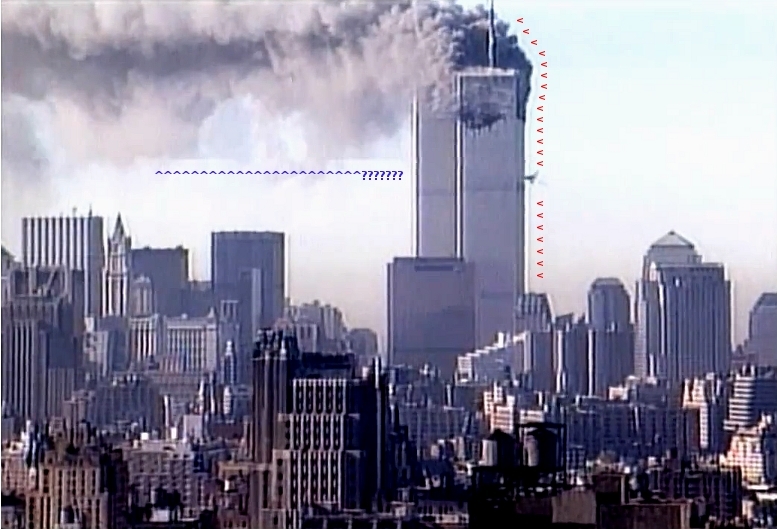 Also, do you also remember - by any chance - those thick black lines seen here around the towers? Could it be soot? sorry, i've seen this picture has been posted earlier. Profound state of shock and disbelief I am continuing to be shocked since I joined this forum. Only not so shocked as these guys. State of the matter is far sicker than I had thought possible. MarioOnTheFly wrote: sorry, i've seen this picture has been posted earlier. No its a good thing to repost pictures and from before. Some times it helps a re-examination and things that have been missed may become relevant. That picture you placed up, always makes me laugh. I mean honestly who would really believe people would be relaxing like that chilling whilst the trade centre is on fire. Its almost a joke these photo-shops.